I am just about at the half way point of my Ironman training which will span from January until September. This is a great time to get a benchmark of how my fitness is as well as to identify my strengths and weaknesses. That will let me adjust my training plan accordingly to maximize my results come Ironman Lake Tahoe. 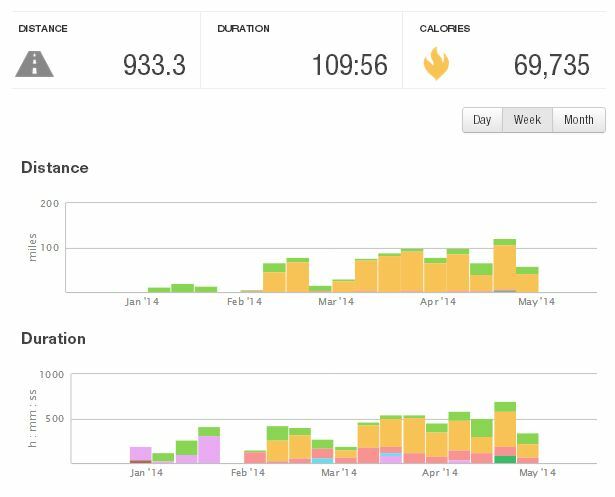 To get some data on my progress so far I signed up for the Wildflower Triathlon’s Olympic distance race. Olympic distance is about a quarter of the length of an Ironman so this is a good benchmark, but won’t throw off my training too much. But before I detail the results of that race, here is how my training has been going. I have been making great progress and am usually within a few miles of my target weekly mileage. The one thing the chart below doesn’t represent well are the differences between running-heavy and biking-heavy weeks. Either way, things are clearly moving up and to the right. I also recently completed my longest bike ride ever. 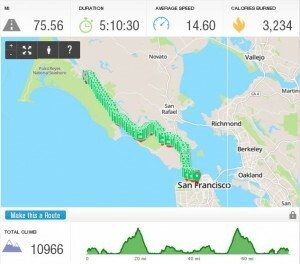 A 75 miler that covered 10K feet of elevation gain. This is far more hill-per-mile than my Ironman race will have, which is intentional. I want to excel at the hill climbs, so I am making sure they are a big part of my training. The one thing not reflected here is quality workouts. I’ve started doing 2 workouts a week at threshold pace. I’ll elaborate on this more in a future post, but basically I’m at the point in my training where I need quality as well as quantity. Threshold workouts are a great way to increase your body’s ability to hold a fast pace for a long period of time – perfect for distance races. I was nervous going into this race. It has been about six years since I’ve done a serious race and it felt a little strange as I prepared. Although this was more of a training checkup than a race for a personal best time – the results would indicate a lot about my current fitness. 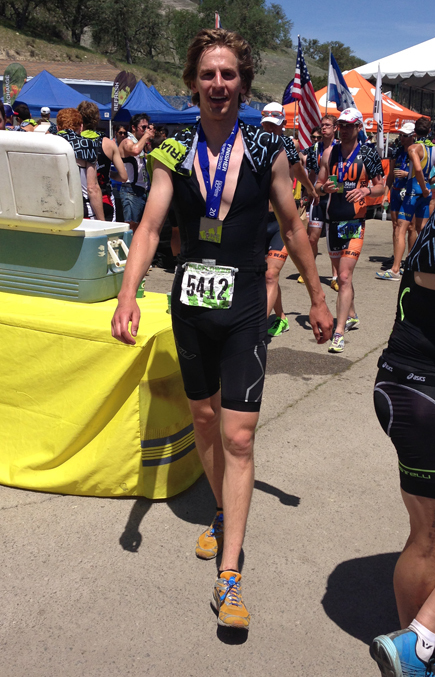 On top of that, never having done a triathlon, there was a lot to figure out. This one was especially strange due to a course modification the organizers had to make because of low water. Getting prepped on Saturday before driving down was a bit depressing. 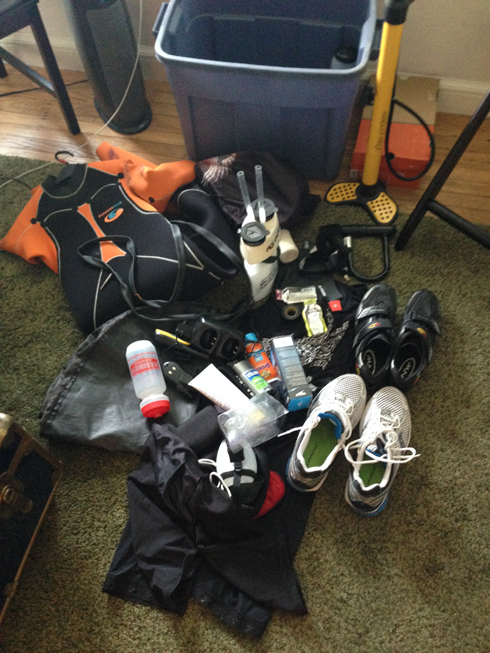 I’m a hopeful minimalist, and putting all of my triathlon stuff in one pile made me realize just how much stuff I have to have to compete in this sport. Sure, it is less than I’d need for scubadiving or space exploration, but much more than running which is just shoes & shorts. Saturday afternoon I arrived on course to drop off my bike at t2, which I would not be visiting again in the morning. I would generally explain the thoughts going through my head as such: “I have no idea what I am doing right now”. Basically I just looked around at how other people had their gear set up and tried to emulate it. I had a lot less stuff than most people though. Here is my T2 setup. It is basically just my bike with helmet & glasses on it. 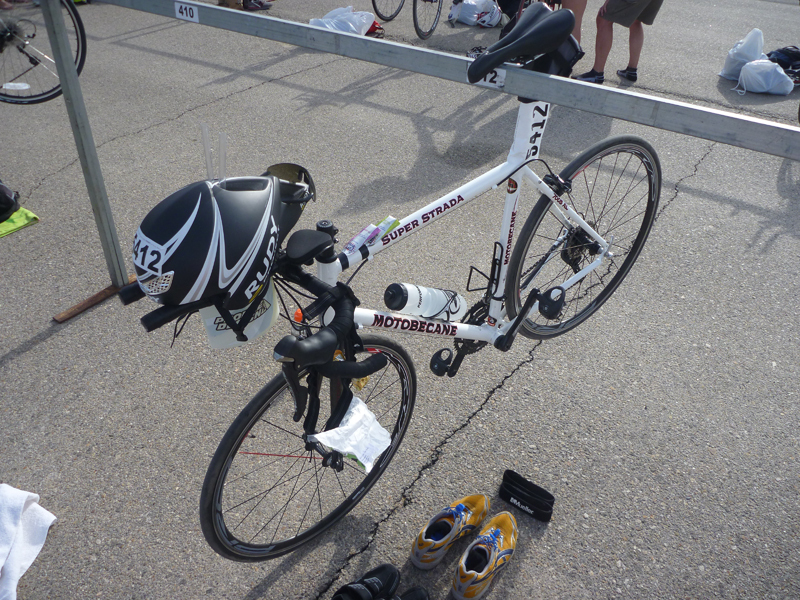 Then two pairs of shoes below & my race bib on the handlebars. I took a few shortcuts like taping Gu to my bike for easy tear off and I made sure to have lots of water since it was ~90*F when I dropped off my bike at 4PM. I did fairly well. 2:42:50. That put me at 21 out of 141 for my age group & 89th overall out of the 1,334 finishers. I set a personal record in the swim with a 26:17 mile. I also set a personal record on the bike with a 1:20:27 40K ride. My run however was 15 minutes slower than my personal record 10K. Compared to the field, I did pretty well. It is tough for me to look at a result like this and be happy though. I’m used to running events where I am usually in the 99th percentile, often finishing on the podium overall or for my age group. I find myself having to remember that this was my first triathlon and I’m only in the base stage of my training, having hardly done any speed work yet. It is probably also important to note that I am in what was the fasted age group for this race. 5 of the top 10 finisher were in the M 25-29 division. 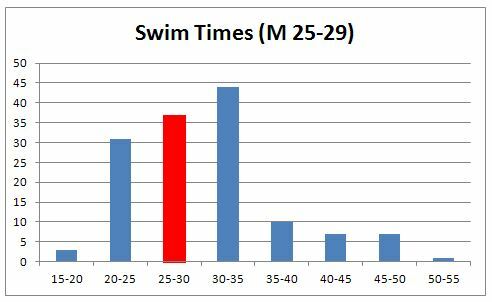 That probably has to do some with the length of race, type of event as well as the peak age for performance. 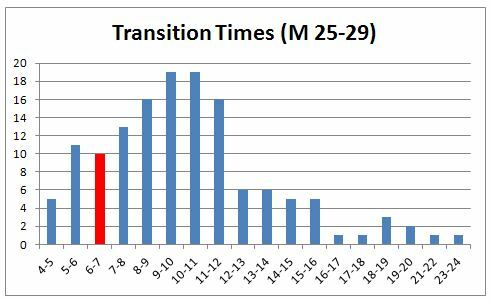 Somewhere between 25-35 most men hit their physical peak for endurance events, so I’m now in the thick of it and will have harsh competition for some time to come. Before I go on I’d like to take a moment for the stats lover in me to remind everyone how awesome race data it. Look at that distribution. It is almost perfectly normal. You could hardly draw a better bell curve and yet this happens naturally in almost every race with more than 1K people. 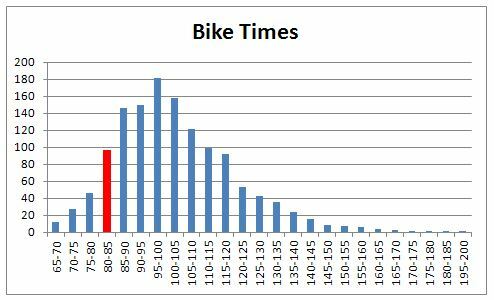 My one stats project from undergrad used data from the Boston marathon because of this and the results were great. I love it. 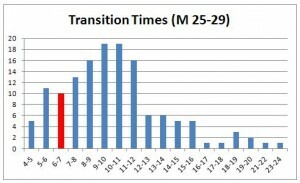 Compared to my age/gender division you can see I was a bit closer to the median. Looking at the swim. I was really nervous about this. I’m not a great swimmer. I am an alright swimmer but it is my weakest event by far. The great news about having a wetsuit is the flotation really helps me. As a tall, thin, lean guy, I have very little float power. I sink. That makes swimming harder than it should be, so I welcomed the added rest that a 5mm wetsuit brings. 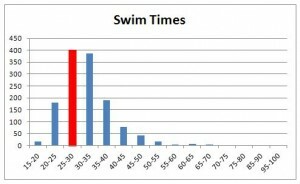 That said, I was hardly leading the pack in the swim. I was basically right in the thick of things, only a slight bit above average. Due to the strange course this year, we transitioned from the swim to the run for 2.2 miles. 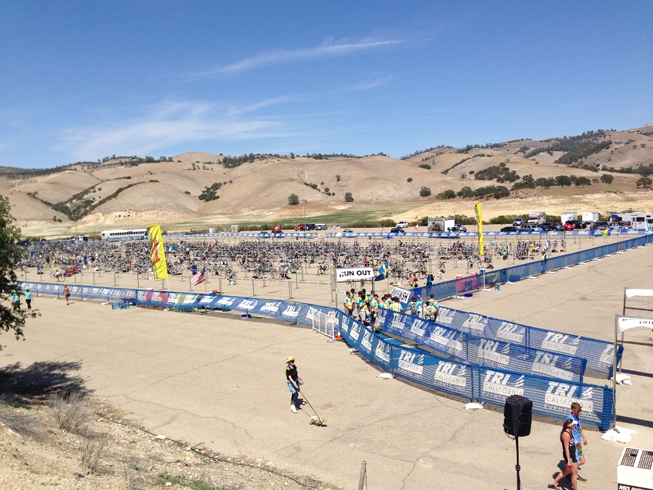 I averaged a 6:50 mile for this section and caught a bunch of people that were faster than me in the swim. As we hopped onto the bike our first mile was a 400ft hill climb. There were people walking and most were standing on the pedals. I shifted into a low gear and spun just like practice. I must have passed 40 people on that climb. During the whole bike leg I was only passed by 4 riders. Each time I heard the distinctive thwump, thwump, thwump of thier disc wheel. Those were serious riders with serious bikes. I passed a lot of people though, a nice change of pace from the swim. I’d say I excelled at the climbing and did a great job staying aero. I only used my brakes twice: once at the turnaround and once at the finish. I was so committed to speed that I took most downhills in aero, in my highest gear, pedaling at a decent cadence. I’d estimate I was going around 35mph for those downhills, but I’d have to double check my gear ratio to be sure. The second part of the run killed me. I averaged 9 minutes per mile for the 4 miles. Part of this was because I had a bright idea at the beginning to start off by sprinting for 100 yards. I thought it would help get my legs into gear. Turns out it just gave me a huge cramp and I could barely move. As I got to the hill – the beast of a hill (maybe 400 ft over 1km) – I started walking. This is the first time in my years of racing that I’ve ever walked during a race. The sad part is that the people running were hardly moving much faster. Summarize like this – I felt pretty horrible about the run. Ironically, that was the leg I did best at compared to the overall field. Though I’m sure those first two miles are what redeemed it. So those are the three legs of the triathlon. 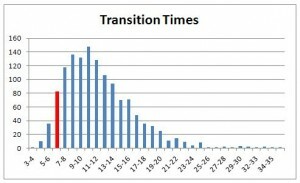 But there is actually one more timed factor, the one I was most nervous about – the transitions. I had only practiced these one time each and was worried I’d mess something up. I don’t think my time being slow would have been that bad, as they are so short, but I was worried I’d start running and have forgotten something. I guess going simple helped because I did pretty well at transitioning. Do all of those charts look pretty much the same? Here is how I stacked up compared to the field and my division in each of the events. 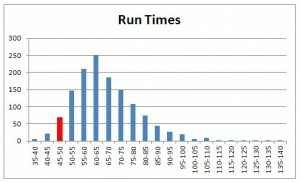 The bars represent my percentile or the percent of people who I was faster then. So the closer to the top, the better I did. You can see that overall I was in the 90th percentile and the 85th percentile for my division. Swimming was my worst and transitions were my best. Biking was actually better than running when looking at my division. Competed at everything. For my first event I’m pretty stoked I was able to show up and post pretty good time at everything. I didn’t hit a wall, forget gear, go off course or crash. That was a respectable race and I should acknowledge that. 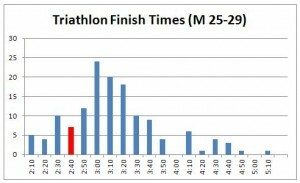 If I were able to keep up the same paces for an Ironman, my finish time would be 10:46:51 – that is a nice goal to have that seems a lot more achievable now. Biking hills. I just bought a bike a few months ago and have quickly established myself at that sport. 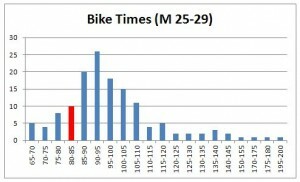 I’m really excited about how I did on the bike, especially on the hills where I passed a lot of people. I wasn’t sure if it was going to be a weak event for me or just a wash, but I now know that it is actually one of my strengths and something I can leverage come Tahoe where there is 8K+ ft of climbing. Swim. 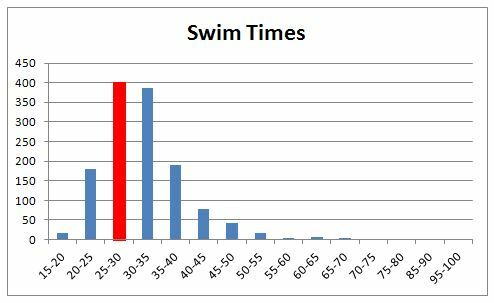 I know it was my weakest event, but I’ve never swam a mile that fast before. I focused on holding my rhythm, drafting where possible and staying on a straight line. I think I did those well despite the random kicks and people swimming into me. This is a big confidence boost in the water. The great news here is that the swim portion of this race was actually more than in an Ironman. 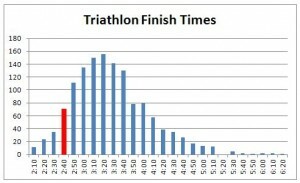 My full race will only have 2.4X the swim where as it will have 4X+ the running and biking. Transition. It was actually the thing I did best at compared to those in my division. Though I hadn’t done it before, I don’t think I need to improve here. My times were fine and I felt like I had everything I needed during the ride & run. 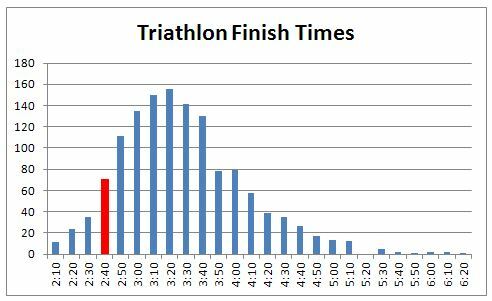 I plan on repeating the same thing again and think that will be fine for an Ironman where a few minutes means a lot less than an Olympic course. Running after the bike. I crashed pretty hard and I don’t know how much of it was low energy vs low water vs poor decisions. Due to the alternate course this year, the run was split into two parts, a 2.2 mile run before the bike and a 4 mile run after the bike. 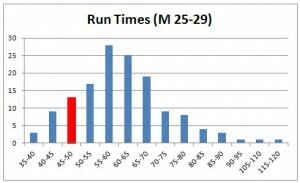 I averaged 6:50 miles for the first 2.2 and 9:00 miles for the later 4. Pretty big difference. Running should be my biggest strength, the one area I know I can make up ground in. I need to be in 99th percentile here. Bike prep. 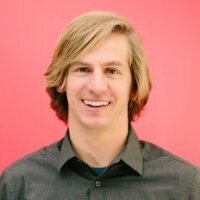 I made some dumb prep mistakes. I’m used to training rides where I bring a lot with me because I don’t stop or have assistance, so I had my water bottles full. In total I had 74oz of liquid which is about 4.5lbs. I ended up finishing with 24 oz left and I had dumped out another 12. In total that means I was carrying 2-3 extra pounds at all times. I didn’t make use of the volunteers handing out water bottles and that resulted in extra weight which could have saved me a few minutes. I also made the dumb mistake of racking my bike the day before when it was warm. My tire pressure was significantly low as I started riding in the cool morning. It was noticable enough that I almost stopped to add some CO2 but decided to ride it out – I thought the time to stop wasn’t worth the benefit of a little pressure. After the race I checked and I was at 80psi on the rear and 85psi on the front. I prefer to ride around 110psi, so once again, I left time on the course. I hear serious bikers shave their legs too… I’m not sure how I feel about that one. Leaving it all on the course. I sprinted to the finish. I should never have enough energy to sprint at the end of a race. The image below is a picture my wife took moments after I finished. When I run a race hard, pictures of me at the finish should either include vomit, passing out or signs of physical shock/trauma. That, in contrast, almost looks like a smile. I phoned it in on the run and need to get back my edge so I can dig deep. Bricks. This is the name of a workout where you go for a bike ride and then finish it with a few miles of running. 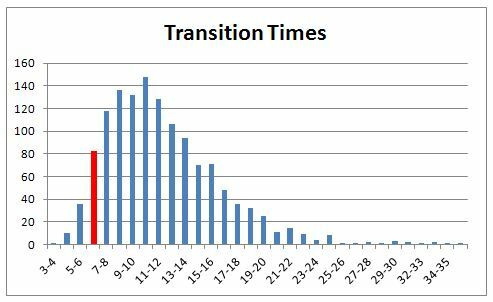 It helps with that transition and is key to any triathlon plan. I’ve avoided them so far as my main goal was to just get familiar with cycling. Starting now all of my long rides will include some running at the end. Better race planning. I need to leverage everything at my disposal in the race. I should be refueling as much as possible while moving so that the average weight I carry is lower. Before Tahoe I will study the water stations and hill patterns to make sure I’m light on the up hills. I want to manage my water like Walmart inventory – just in time. I should be running out of water right before stations and grabbing more, that way I’m carrying less weight on average throughout the course. 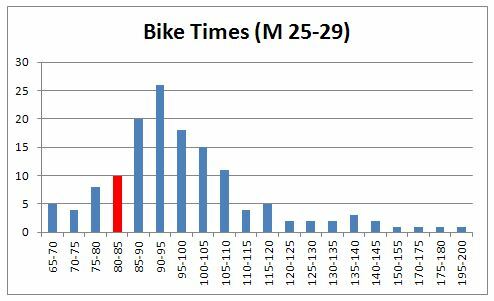 I’ll also need to do a better job making sure my tire pressure is correct for the race conditions so I know I’m operating with a well tuned bike. Repeats. There is nothing that get you better prepared to leave it all on the course than some mile repeats. They are long enough that you really have to work but short enough that you know you can actually do it. Look for some 5 X 1mile @ 5min on my training plan in the near future.